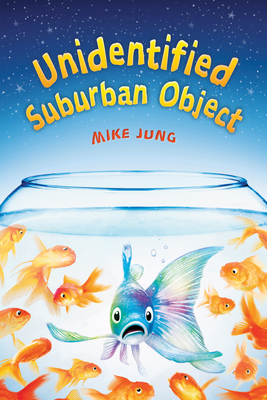 Unidentified Suburban Object takes a fish-out-of-water tale about a Korean-American girl who has always felt out of place to a whole new dimension. Chloe’s is the only Asian family in town until a new teacher, Ms. Lee, arrives. Without giving away the hilarious and surprising twist, suffice it to say that Chloe makes a world of discoveries about her family and heritage. It is easy to love these characters and to root for the transformation just about every middle schooler faces. Mike Jung has a quirky and delightful sense of humor. The cover art is both apt and charming. The next person who compares Chloe Cho with famous violinist Abigail Yang is going to HEAR it. Chloe has just about had it with people not knowing the difference between someone who's Chinese, Japanese, or Korean. She's had it with people thinking that everything she does well -- getting good grades, winning first chair in the orchestra, et CETera -- are because she's ASIAN. Of course, her own parents don't want to have anything to DO with their Korean background. Any time Chloe asks them a question they change the subject. They seem perfectly happy to be the only Asian family in town. It's only when Chloe's with her best friend, Shelly, that she doesn't feel like a total alien. Then a new teacher comes to town: Ms. Lee. She's Korean American, and for the first time Chloe has a person to talk to who seems to understand completely. For Ms. Lee's class, Chloe finally gets to explore her family history. But what she unearths is light-years away from what she expected. Mike Jung is the author of Geeks, Girls, and Secret Identities and contributed to the anthologies Dear Teen Me, Break These Rules, and 59 Reasons to Write. He is a library professional by day, a writer by night, and a semi-competent ukulele player during all the times in between. Mike is proud to be a founding member of the #WeNeedDiverseBooks team. He lives in Oakland, California, with his wife and two young children. Find Mike at www.mikejung.com. *Are you kidding? We’re not giving this away! You have to read the book!